Pick up at the Hotel/Riad at 9am in the morning. 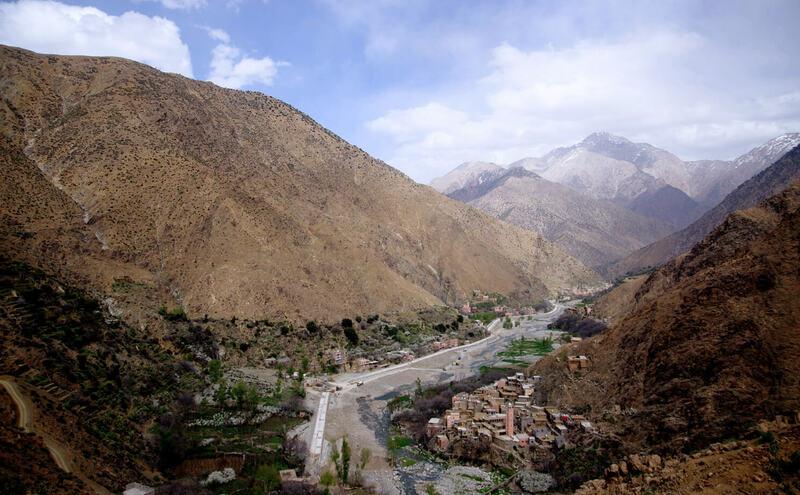 We will drive south of Marrakech for a nice day tour to Ourika Valley. After around (30 Kms, 18.64 miles) the lush valley of Ourika starts. The Valley of Ourika is planted with olive, walnut, apple, apricot, cherry trees and much more. We will visit a local “Berber” house to explore their way of life and enjoy the tea ceremony lesson. Majestic views and varied landscapes of Berber villages built in adobe and stones. They are worthy for nice pictures. En route we will stop at an Argan Cooperative, run only by women. You will witness women cultivating the Argan nut to make Argan oil, soap, Amlou and cosmetic products. Arriving at Setti Fatma Village. We will go hike up to the famous waterfalls of Setti Fatma with a local mountain guide. On the way, you will enjoy the natural beauty. The walnut trees cover the whole area. The forsest hosts Barbary apes. A nice lunch will be served by the overflowing river of Ourika or at the terrace under the sunshine. In the afternoon return to Marrakech where we will drop you off at your hotel. Hammam square, the great mosque Jamaa El Kebir (15th cent. ), the craftsmen centre, Ras el Ma source 3 km/1.9 mi far overlook its lime-washed walls soaking up the blazing sunlight give a beautiful landscape. Nothing could be better than a stroll through the twisting alleyways of the medina or to watch the locals stitching babouches (slippers) and djellabas, at the foot of the Kasbah, in the doorways of houses dating back to its foundation in 1471. In the afternoon drive back to Fes, you can enjoy nice view of Rif Mountains.